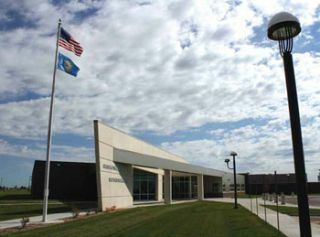 The Sioux Falls School District in South Dakota created its Career & Technical Education Academy to give vocational high school students industry-relevant education. So when it came time, in 2010, to equip the newly built CTEA’s media production department, Sioux Falls pulled out all the stops to create an all-HD TV studio facility. CTEA’s sleek new all HD production facility in Sioux Falls. Media production students at the Career & Technical Education Academy produce programming that is aired on KLRN-TV (Midcontinent Channel 20), the cable channel of Sioux Falls public schools. The content includes daily newscasts as well as long-form programming focused on regional nonprofit groups, such as the local humane society. The CTEA’s TV production facilities would do any medium-market commercial broadcaster proud. The all-HD master control room looks into a fullsize three-camera TV studio. Mounted side by side above the bank of windows facing the studio are two LG 42-inch HDTV monitors that serve as a virtual monitor wall. In addition, two classrooms are set aside for editing and instruction. One of these has desktop video-editing stations; the other allows students to plug in their laptops for editing and Web access. Add three storage spaces, offices and a lobby that connects to the academy’s main hallway and the result is a self-contained TV station. One of the most striking features of the CTEA’s master control room is how spread out the operator functions are. For instance, a long counter beneath the windows hosts the video switcher, audio board, and graphics and video playback stations with room to spare between them, so that each requires a separate person to be dedicated to it; the complex’s other functions are laid out similarly. The Sioux Falls School District didn’t stint when it funded the Career & Technical Education Academy. The three studio cameras are JVC GY-HD250s with 16X studio lenses. “These cameras were the best combination of 3 CCD HD capability and price,” Johnson says. “We equipped them with JVC 8.4-inch studio viewfinders, proper CCU units, and broadcast- quality Vinten Vision Ped Plus studio pedestals. A lot of teaching facilities try to save money by putting fixed tripods on dollies, but the school district wanted the real thing for its students.” All the JVC cameras have Autoscript 15-inch color camera prompter kits that are fed by Autoscript WinPlus S prompting software. Top: CTEA’s editing lab. Bottom: CTEA’s professional TV station lobby. Video routes by means of a Broadcast Pix Granite production switcher and router. A Mackie Onyx 24-input mixer handles audio. Recording and playback is done to hard disk and Sony HDV video recorders/players (for playing back video shot in the field). The PCs are Dell, and a Telex intercom system links the studio. The CTEA’s 20 editing stations have HP desktop PCs running Adobe Premiere Pro, After Effects, and the CS5 Production Suite. Video is stored on external 1TB LaCie drives on each PC, all of which are with the school’s servers. CTEA’s studio features broadcast-quality cameras and pedestals. The technology of the Samsung 650TS enables touch-sensitivity all the way to the edges of the screen. samsung.com. The LG 42-inch class LCD full HD 1080p resolution monitor, the M4224C features split zoom capabilities for video wall applications and provides LAN and video wall control for easy scheduling and dissemination of content.lg.com. SunBriteTV model 5510HD is a 55-inch full- HD 1080p LCD TV engineered for permanent outdoor installation. sunbritetv.com. The Hitachi Software StarBoard T-19WX gives you the ability to add interactivity to your digital lectures. Write notes on the display using a wireless pen, while students view the same visuals projected onto a large screen through your computer and a projector.hitachi-soft.com. The Sony large format 42-inch interactive LCD Touch Screen Monitors provide touch screen interaction with a display. sony.com. The NEC MultiSync Professional Series features the 40-inch P401 and 46-inch P461 (pictured) for digital signage applications. Its high contrast, industrial-strength design and Enhanced Digital Signage Technology Suite. Visit nec.com. NextWindow’s 2700 Overlay Touch Screen turns most large LCDs or plasmas into an interactive multi-touch display. Simply touch the screen for a more engaging way to connect with information. nextwindow.com. Mitsubishi’s MDT521S monitor is a 52-inch LCD monitor built with a commercial-grade panel designed for public information display and digital signage applications. Visit mitsubishi.com.